Happy New Year! I’m not normally one for making new year resolutions, and don’t really intend to start. However, I often use the newness of the year to reflect on years gone by, as well as wonder what the future has in store. 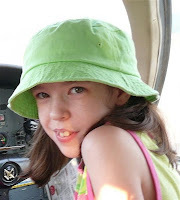 January 3, 2001 - Our daughter had her appointment with a developmental pediatrician this morning. It’s not exactly very encouraging news. She has been diagnosed with a moderate form of Autism, or Autistic Spectrum disorder. Plus, she has Sensory Integration Dysfunction - which means she is very sensitive to certain sights, sounds and textures, making it hard for her to learn about the world around her. Doc suggested she begin seeing an Occupational Therapist soon, to help out with that. So, I set up an appointment with our Service Coordinator through Child and Family Connections. She will be out tomorrow morning to help us pick out a therapist. David and I are taking this news a bit hard. I don’t know what all David is thinking because he is at work right now and we haven’t had much of a chance to talk yet. But, I know he is upset and wants to come home. We have both suspected autism for quite some time now, but it didn’t really hit home until the doctor said the word out loud. When she said the word “autism” my heart skipped a beat. Our fears had just become reality. I have been on the verge of tears through-out the day. I haven’t actually broken down yet, though. I guess I’m just trying to let the news sink in a bit. I’ve been keeping busy most of the day, to help keep my mind off of it, too. I just don’t know what I’m going to do. How will I take care of a child with autism? Doc gave us a long list of books that we can check into for more information. I guess I’ll have to start with a couple of them and go from there. It’s just really sad and frustrating to know my daughter has this disorder, and there’s no known cause or cure for it.... There is a good chance she will be able to adjust to this disorder so that others won’t even be able to tell she has it. But, there is also a good chance that she will never be socially compliant, and will probably never even have a serious relationship or get married. It’s really disheartening. As parents, we have so many hopes and plans for our daughter. We want her to excel as a student and as a person, and grow up loving the Lord and serving Him. We want her to one day fall in love, get married, and basically just be happy. I know that sometimes what we want for our kids is not what the Lord has planned. But, it still hurts. I guess the main thing right now is that there’s so much uncertainty. We just don’t know how severe her disorder really is, and whether or not she will improve. We really won’t know until she is older. Doc said she will not get any worse, but she could get better. So, that’s what we’ll have to pray for. Hopefully, our daughter will be at the high functioning end of the autistic scale. But, if she’s not, we will still love her no matter what. She is our child, our beloved daughter, our flesh and blood. She means the world to us and we are glad she is here to brighten our days with her smile. As I look back on that day and remember, I sometimes wish we had never had to experience it. But, at the same time, I know the Lord used this event to help my husband and I learn and grow in various ways; and, even though we have accepted our daughters autism and love her for who she is, we will never stop learning and growing; but, we will continue to trust the Lord to give us wisdom regarding her needs. Being a Christian does not mean everything in our life will be perfect, but it does mean we can rely on the Lord to give us the wisdom and strength we need to get through it. With the wisdom that only God can give, our daughter has made wonderful progress over the years and has overcome many obstacles. She continues to improve and we feel so blessed to have her in our lives. I can't imagine the struggles that your family has overcome through the past 10 years....you always want the answer to a problem, but that doesn't mean that you like it. Elizabeth truly is a blessing. I have no doubt that God has a plan for her life. Your sweet spirit has been an encouragment and blessing to me! You opened up your heart and allowed us to see a very intimate part of you. We all love Elizabeth. She is a gem. You both have been formed into lovely vessels that has indeed been poured out for others to be drawn to Jesus.